I was at the Detroit unveiling event of the Mahindra Roxor yesterday, and, like many people, I was pretty delighted with what I saw. I was delighted because the Roxor isn’t like the usual plastic-bodied side-by-side little off-roader; it’s a real... Jeep. There’s no other way to put it. The Roxor is an old-school Jeep. Which may lead you to wonder: how can Mahindra build a Jeep? Can’t only Jeep build Jeeps? The question isn’t really quite as simple as that, of course. Really, the Roxor isn’t exactly a Jeep, it’s a (admittedly heavily modified) Mahindra Thar, which is, yes, a license-built Jeep. And that’s pretty much exactly why Mahindra can build the iconic Jeep without worry—they’ve had a license to do so since 1947. Mahindra was one of the earliest—1947, remember—Jeep licensee, and has had agreements with every one of the many companies that have been stewards of the Jeep brand over history: Willys, Kaiser, American Motors, Renault, Chrysler, Daimler, the Cerberus group, and now Fiat. That’s insane. It also means that technically, Mahindra has had the rights to the Jeep design for decades longer than the current owner, Fiat Chrysler, has. The point of all this is to say, yes, Mahindra can damn well build a Jeep if they want to. Now, it’s notable that the Roxor does not have Jeep’s jealously-guarded trademark seven-slot grille, even though the Thar in India and other markets uses it. That grille has become so iconic and associated with Jeep that it is now Jeep’s logo, even if, technically, that was a Ford design. Jeep really, really doesn’t want anyone else using that seven-slot design in America, which is why Mahindra agreed, in 2009, to not use it for any possible American-market vehicles. That’s why the Roxor uses what Mahindra calls a ‘four-and-a-half’ slot grille. It’s worth noting that Mahindra did not contact FCA/Jeep at all regarding their bringing over what is, essentially, a non-highway approved version of their most iconic car. To put this in some sort of perspective, it’d be sort of like if Nissan decided to use their long-dormant Austin license to build new, non-street legal original Minis. BMW, who now owns the Mini brand, could possibly find that troubling, right? Look, it’s one of Mahindra’s postal truck test mules! Mahindra admits that the response to the Roxor (and the response to their possible new Postal Truck) will be used to determine if a future in American road-legal vehicles is something that makes sense for them. This is a question that many of us who watch the Indian automotive market have been wondering about, and, personally, I’d love to see it happen. Seeing all these brand-new Roxors was sort of an amazing thing. This is an incredibly honest and pure version of one of the most iconic cars in history—it’s arguably got more original Jeep DNA in it than Jeep’s own 2018 Wranglers do, after all. One strange thing about all of this: much of the Roxor is built from CKD (completely knocked down) kits from India. 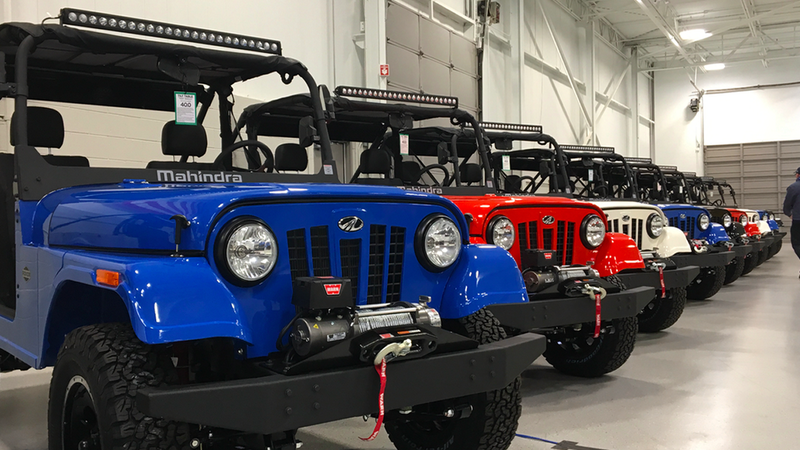 That means the Jeep design has come full circle: originally, Mahindra was building Jeeps from CKD kits from America, and now America is building Jeeps from CKD kits from India. Man, this is a weird world. Even if these things aren’t road legal and have no windshields and very stripped-down interiors, I can’t help but be excited that there’s, basically, a Thar in America. I found these to be incredibly capable off-road, and I can see Roxors being appealing to markets beyond the usual side-by-side ATV-type customers. Could this be a good alternative to getting an original old Jeep to use just for off-roading? Could parts from a Roxor be used to resurrect a genuine old Jeep? I’m almost sure the aftermarket will come through to provide parts to turn these into highly capable off-road little monsters, which is an exciting thought. I really wasn’t expecting this, but I’m thrilled to see it happen. As far as I’m concerned, the more new-yet-highly-original versions of iconic cars available on the market, the better. Maybe Tata will take a hint and bring back a side-by-side that looks like an old E-Type, or we’ll get an ATV version of a Renault Dauphine from Nissan.